After spending long hours in the kitchen preparing the main course for the big family gathering, the last thing you want to do is toil several hours more making dessert. Now you can prepare the all-time Filipino favorite Leche Flan dessert in the popular Instant Pot or most multi-cookers in half the time. This rich, creamy custard cooks in less time and the Instant Pot or multi-cooker allows you the advantage of walk-away-from-it cooking that let’s you do other thing that need your attention. Serve this for a dessert or snack during the holidays. To make the caramel: Pour the sugar into a small, heavy stockpot set over medium heat on the stove. It will take about 5 minutes for the sugar to start bubbling, starting at the edges and moving to the center. Tilt the pan around to keep the syrup level. Once the white sugar turns an amber color and is boiling, quickly pour the caramel into the round cake pan or divide equally between the 2 llaneras. Set aside. In a large mixing bowl, gently whisk the egg yolks. Add the evaporated milk and mix well. Pour in the condensed milk and vanilla extract. Blend the ingredients. Pour the custard mixture through a sieve placed over the caramel-lined cake pan. If using llaneras, fill each container ¾ full. Cover the flan pan or llaneras with aluminum foil and seal tightly. Place the steamer rack with handles inside the pot. Fill the inside pot with 2 cups of water, reaching up to the edge of the rack. For each llanera: Cook one llanera at a time. For a round cake pan: Be sure to use a 7-inch diameter metal pan that fits inside the multicooker. Wrap the bottom of the pan with foil if using a springform pan. Secure the lid. Check that the cooking pressure is on Manual and the release valve is set to Sealing. Select Manual and Steam for 20 minutes for each llanera. For a round cake pan, Steam for 25 minutes. When cooking is complete, use a quick release. Carefully remove the flan by using silicone mitts to hold the handles of the steamer rack. Place the flan on the counter to cool. 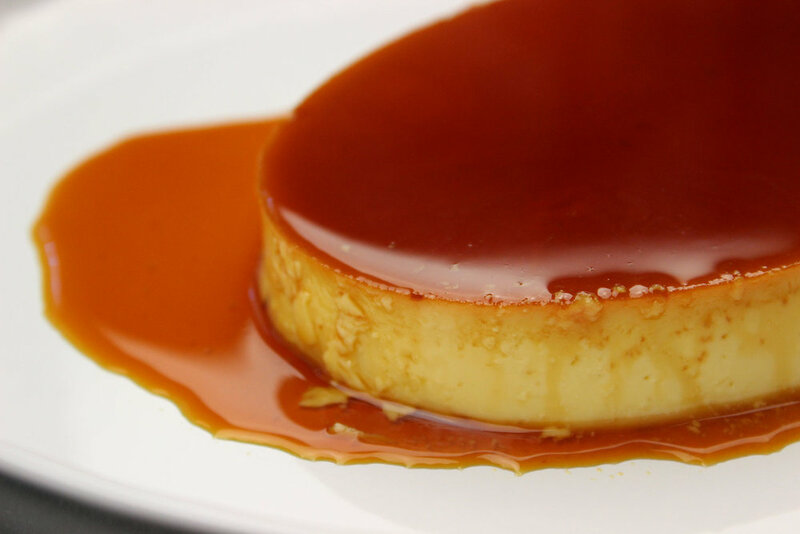 Refrigerate for at least 6 hours or overnight before serving the flan. *Note: When turning on Steam, it takes about 17 to 20 minutes for the Instant Pot to preheat before the cooking time begins. For other multicookers, please consult the product manual. Cook’s comments: As with all appliances, please read the user’s manual of your Instant Pot, pressure cooker or multi-cooker. Follow safety precautions and suggestions. Use cooking accessories which are made of metal or silicone or those specifically recommended for the Instant Pot or multi-cooker. Do not use glassware. Elizabeth Ann Quirino, based in New Jersey is a journalist and author of the “Instant Filipino Recipes: My Mother’s Philippine Food In a Multicooker Pot” Cookbook. She is a member of the International Association of Culinary Professionals and blogs about Filipino home cooking on her site AsianInAmericaMag.com.